The HAF and its allies may have PR machinery and hundreds of thousands of dollars in their war chest to selectively change textbooks, but they are still on the wrong side of history and humanity. Suhag A Shukla and the Hindu American Foundation (HAF) continue to obsess with rhetoric rather than facts, as seen in the article titled “Erasing Facts: What SAFG activists have really done to Hinduism and India in California textbooks”. The HAF alliance of conservative Hindu groups refuses to acknowledge the bigotry behind their relentless push to make changes to the California curriculum. Their efforts have drawn criticism from a wide spectrum of the South Asian diaspora in the United States, including scholars of history from premier educational institutions, as well as the South Asian Histories for All Coalition which represents progressive Hindus, Dalits, Sikhs, Muslims, Ravidassias, Buddhists and Christians. The HAF alliance seeks changes that can only be described as ahistorical edits to history textbooks, under the unfortunate guise of protecting the self-esteem of Hindu American students. The sum of the HAF Alliance’s recommended edits to the California textbook frameworks reflects a dangerous attempt to equate India solely with the Hindu tradition and to either appropriate or “other” the many diverse religious traditions of the region. They include a suppression of the religious origins of the caste system, erasing the word Dalit, stripping Sikh immigrants of their Sikh identity, expunging Guru Nanak’s celebrated denouncement of caste, and inserting Islamophobic statements. Rather than descending to similar rhetorical and hyperbolic commentary, the South Asian Histories for All coalition would like to focus on the direct edits from the HAF alliance, that attack various religious traditions and South Asian identities. The Sikh tradition is sought to be grossly misrepresented in the edits submitted by HAF and its allies. 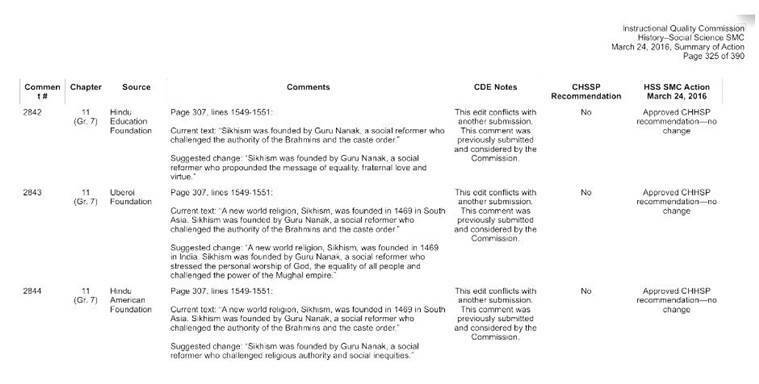 The current text in Chapter 11 of the Grade 7 textbook contains multiple references to Guru Nanak, the founder of Sikhism, as a social reformer who challenged the authority of Brahmins and the caste order. HAF and its collaborators have petitioned the California Board to expunge any mention of Guru Nanak’s well-established denouncement of caste. Sikhism as a distinct religion grew out of a resistance to inherent caste bias within Hindu society. It is therefore not surprising that the Hindu American alliance has submitted three different comments, in an attempt to try to erase an essential element of Sikhism’s foundational history. To erase Guru Nanak’s repudiation of caste is to disavow the founding of the Sikh religion, something HAF is not averse to, given it has attempted in other edits to suppress Sikhism’s autonomy and strip Sikh immigrants of their Sikh identity. This revisionism of the founding of Sikhism fits in neatly with the HAF alliance’s relentless efforts to undermine the authenticity of resistance movements against the caste system. It is also aligned with the Hindu nationalist position of either erasing other religious traditions by co-opting them as sects of Hinduism, or by denouncing them as foreign faiths that were brought into India by invaders or missionaries. Another ally of the HAF is the Hindu Education Foundation (HEF). This group is an educational project of the Hindu Swayamsevak Sangh and a member of the family of organisations that make up the Hindu fundamentalist ecosystem. The HEF’s ideological underpinnings are revealed in its suggested edits on Islam. The comments portray Islam as violent, and Mughal rulers as a monolithic invading force in South Asian history. These edits remove all references to the religious harmony and syncretic traditions promoted by several Mughal rulers. This characterisation of Mughal rule as a hegemony marked by persecution of Hindus, flies in the face of several historical facts. For instance, Aurangzeb’s army that fought Shivaji’s Maratha warriors were comprised mainly of Rajput Hindus, and the Mughal ruler’s greatest ally against Shivaji was Mirza Raja Jai Singh, the Hindu ruler of the kingdom of Amber. Shivaji appointed a Muslim, Darya Darang as the Chief of the Navy, and a significant portion of Shivaji’s army and navy comprised of Muslims. In addition, the Maratha invasion of Bengal that lasted a decade starting in 1741 resulted in the slaughter of about 4,00,000 Bengalis, mostly Hindus, by their Hindu brethren. What these facts demonstrate is that Indian history has always been complex, and far more nuanced than the overarching and binary “Hindus versus Muslims” narrative espoused by the Hindu nationalist movement in India, and by the HAF and its collaborators in the US. That both Mughal and Hindu rulers embraced diversity, or that Hindu kings fought each other just as often, are inconvenient truths that do not fit their narrow ideological confines. HAF’s attempts to revise California textbooks seek to supplant historical facts with a bleak and falsified rhetoric of Indian history as a perpetual battleground, not between competing kings but between invading Muslim rulers and a victim Hindu population. To link this historical revisionism with the self-esteem of Hindu American children is a cynical use of children as pawns in an ideological battle. The alliance’s push to colour history with a specific ideological tinge includes an attempt to negate Islam’s prominence in the region centuries before the modern nation state of India came into existence. The same Grade 7 textbook quoted earlier states: “Islam became firmly established politically in the north as well as in some coastal towns and parts of the Deccan Plateau, although the majority of the population of South Asia remained Hindu.” The alliance would prefer this to be entirely replaced by fulsome praise for the Hindu Vijayanagara empire, that upheld and followed the oppressive caste system. This reference to “forced to convert most of the time in India…” is an oft-repeated canard in the Hindu nationalist discourse, on how Islam spread in India. In truth, Islam arrived in India long before the Mughal rulers, through Arab traders and the great Sufi saints who converted hundreds of thousands to Islam through their spiritual teachings. In short, what is at play here is not the self-esteem of Hindu or any children, but attempts to extend Hindutva revisionism to the United States. Particularly insidious is HAF’s sustained attempts to obliterate the roots of caste discrimination in Hinduism, and erase Dalit identity. In HAF’s Not Cast In Caste report, the HAF sought to portray caste discrimination as having no basis in Hindu scriptures, a position that was quickly denounced by prominent Hindu leaders that the HAF was courting for endorsement. The Uberoi Foundation also deleted the term Dalit in its comments to the California Board of Education, claiming it was used for gaining ‘leverage mostly in elections and for economic concessions’. This horrific statement denies a historically oppressed community its identity and its struggles; it could be compared to saying that ‘African Americans’ should not be referenced in history and social science textbooks around slavery because the term gained usage in the 20th century. It is cynical and dismissive of histories of resistance against oppression. This is why the debate around California textbooks and their depiction of history matters beyond any particular religion or ideology. It strikes at the heart of education itself: the integrity of learning. History should be studied not to bolster or diminish any one community’s self-esteem or pride. It should be studied to understand the complex realities of the human condition through an accurate and nuanced reading of the past. We can and must teach our children that compassion, empathy and respect for fellow human beings should transcend narrow and parochial notions of “loyalty” to one’s religious or ideological community, and that multiple perspectives and facts comprise a historical view. The HAF and its allies may have PR machinery and hundreds of thousands of dollars in their war chest to selectively change textbooks, but they are still on the wrong side of history and humanity. No amount of spin can change that. 1 JNU protests: What is at the core of the ongoing movement?